This time of year, you may run into people who demand (through their supposedly innocent recital of “We Wish You a Merry Christmas”) some figgy pudding. There are many figgy recipes available, some dating back to the fifteenth century. This recipe is a twist on the old figgy pudding using the figs and raisins as sweeteners. Soak the dried figs in the lemon and orange juice for one hour. In a food processor, mix the almonds, coconut flour, cashews, salt, cinnamon and nutmeg until smooth. Remove and place in a bowl. In a food processor, place the soaked dried figs and juice and the zest and mix until creamy. You now have a fig puree. Add the fig puree into the dry nuts and gently mix. Place in a dehydrator at 115 degrees for about three hours. Remove from dryer. Place a plate on the bottom of the mold and remove the figgy pudding. Carefully peel the parchment paper from pudding. Serve the figgy pudding toped with cashew cream or a dusting of powered carob. Preheat oven to 325 degrees. Place figgy pudding in oven and bake for one hour. Insert a skewer to test the pudding. If it comes out clean then the pudding is done. Well the first thing to know is that figgy pudding is more of a cake than what we think of as pudding. This is a British treat, and over there pudding really means any kind of dessert, not just custards. The next thing to know is that it is not that fruitcake that is passed around every year. There is more to this sweet than just the pudding. When “We Wish You a Merry Christmas” was popularized, it was quite common for groups of singers to entertain the wealthy. In return they would be given money or food. At Christmas time it was traditional to shower gifts upon these singers. The number represented Jesus Christ and his 12 disciples. To represent the path that the wise men traveled in search of the newborn king, figgy pudding was mixed east to west. Figs happen to be the main ingredient in figgy pudding. 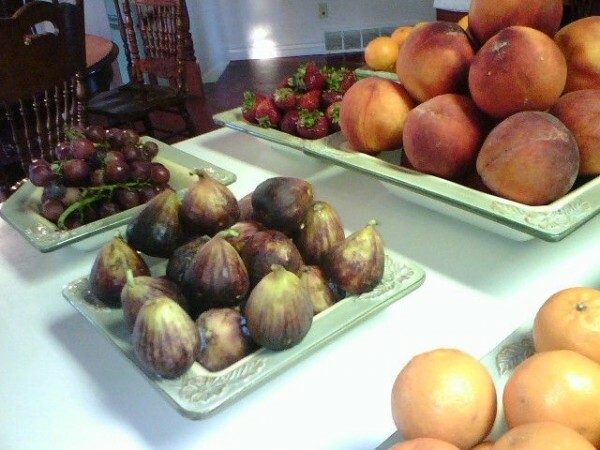 So other than their use in figgy pudding what are figs and why are they so important? The earliest written record of figs is when Adam and Eve use the leaves to cover their nakedness in the Garden of Eden. In ancient Greece, figs were so in demand that those who won the Olympic games were honored with a crown of fig leaves and figs. Figs are low calories at about 74 for 100 grams, and are full of heart healthy minerals potassium, magnesium and calcium. Research has shown that these minerals reduce high blood pressure. Figs have a high fiber content which may explain why historically, dried figs were used as a laxative. Dried figs are powerhouses of nutrition. When they are dried the nutrients are concentrated. A fourth-cup of dried figs has almost four grams of fiber and other minerals. Look for organic figs to avoid sulfur dioxide, a preservative used to maintain color. This holiday season it may be time to take a second look at the fig. When carolers come singing for figgy pudding, you can surprise them by giving them some.